The United Nations General Assembly adopted resolution A/RES/67/200 on 21 December 2012, which declared that 21 March of each year is to be observed as the International Day of Forests. The resolution encourages all Member States to organize activities relating to all types of forests. Activities expected to take place on the International Day include tree-planting and other community-level events, and national celebrations including art, photo and film as well as social media outreach. Forests cover one third of the Earth’s land mass, performing vital functions around the world. Around 1.6 billion people – including more than 2,000 indigenous cultures – depend on forests for their livelihoods, medicines, fuel, food and shelter. This entry was posted in Relevant projects on 21 March, 2018 by Ángeles Gutiérrez Zarza. Today, 21 of March, we celebrate the International day for the Elimination of Ratial Discrimination, including any discriminating treatment towards indigenous people. All human beings are born free and equal in dignity and rights without distinction to their origin, ethnicity or religion. On the occasion of the International Day for the Elimination of Racial Discrimination, the European Union reaffirms its strong commitment to the values of unity and coexistence, and to the fight against racism, discrimination, xenophobia and exclusion in all their forms, inside and beyond our borders. Demonstrations of discrimination, hatred and intolerance are still triggering conflicts in many countries around the world, forcing people to flee and generating intolerable human suffering. And are on the rise also in our European Union. A society where human rights are not guaranteed for all is more fragile, less resilient and is more prone to conflicts. The European Union is promoting the universal ratification and full implementation of the International Convention on the Elimination of All Forms of Racial Discrimination – the universal foundation for the work to prevent and eradicate racism and discrimination. Within the EU, the High Level Group on combating Racism, Xenophobia and other forms of Intolerance compiled guiding principles on hate crime training for law enforcement and criminal justice authorities and on access to justice, protection and support for victims of hate crime. It contributed to further developing guidance on improving the recording of hate crime by law enforcement authorities, currently being tested in several Member States. But this is first and foremost a cultural fight. Supporting partner countries and civil society in preventing and countering racism and intolerance is a guiding principle also of the EU’s external action. Through EU funding, support is being provided to civil society around the world to counter racial discrimination, xenophobia and intolerance. For instance, projects have been put in place in order to improve the Criminal Justice system in Rwanda through human rights education and legal aid provision. In Sri Lanka, support is being provided aimed at strengthening fundamental rights and freedoms in the Northern and Eastern Provinces by improving the quality and the access to legal services in these regions. As this year marks the 70th anniversary of the Universal Declaration of Human Rights, the European Union continues more than ever its dedicated work towards the universalisation of the Declaration’s fundamental values, working closely with all our partner countries, regional and international organisations, National Human Rights Institutions (NHRIs), civil society and human rights defenders, towards the elimination of racial discrimination. The EU will keep working until discrimination, hatred and violence will have no more place anywhere. A regional workshop on Preventing and Countering Violent Extremism, jointly organised by the Lebanese National PVE Coordinator and the European Union was held in Beirut on January 17 and 18. The workshop tackled the topics of radicalisation in prison and online radicalisation. In his speech, Mr. de Kerchove conveyed the difficulty of identifying radicalised inmates at an early stage, a practice that used to be simpler years ago. He also stressed on the importance of rehabilitating prisoners and reintegrating them in society. In this context, the EU Delegation to Lebanon just launched a three-year program targeting violent extremists in Lebanese prisons, with a special focus on the rehabilitation of young adult prisoners. This initiative is based on the belief that an effective criminal justice system that fully respects human rights can significantly deter and prevent terrorist acts. The workshop also addressed the considerable reach and impact terrorist groups have online. Benefiting from a high internet penetration and social media usage across the Middle East and North Africa, and using sophisticated means of communication, terrorist groups were able to create a momentum that will last longer than their military presence. However, a joint effort by the international community, tech companies, local governments and civil society could counter this narrative by providing a peaceful and credible alternative to this violent discourse. The two-day workshop brought together government representatives, experts and civil society groups from the EU and the Middle East and North Africa. This entry was posted in Relevant projects on 28 January, 2018 by Ángeles Gutiérrez Zarza. Justice and Home Affairs (JHA) Council Meeting of 12-13 October 2017 adopted Conclusions on the Mid-term review of the Renewed EU Internal Security Strategy (ISS) 2015-2020. In this document, the Council calls for a comprehensive response in the area of counter terrorism combining an enhanced criminal framework with measures of prevention of radicalisation and more efficient exchange of information on terrorism offences. Further strengthening the linkages between internal and external security policies to make progress towards the implementation of the Global Strategy and an effective and genuine Security Union in particular by reinforcing cooperation with third countries, especially Western Balkans, Turkey, MENA region and Eastern Partnership countries, on shared security concerns and improving information sharing with those countries. This cooperation would encompass counter terrorism and the prevention of the spread of violent extremism and radicalisation (…). The abovementioned Council Conclusions are available here. This entry was posted in Relevant projects on 17 November, 2017 by Ángeles Gutiérrez Zarza. This entry was posted in Relevant projects on 26 August, 2017 by Ángeles Gutiérrez Zarza. An Expert Meeting on “Tolerance against radicalization. Towards a culture of peace and tolerance agains radicalization leading to violent extremism and terrorism” was held in Toledo (Spain) on 10 and 11 July 2017. The first day the Meeting took place at the Faculty of Law of the University of Castilla-La Mancha, whilst the second day the Meeting was celebrated at the Tapestry and Textile Museum of the Cathedral of Toledo. The Agenda of the event is accesible here. The Meeting was kindly inaugurated by the Dean of the Faculty of Law, Mr Alberto Sanz, who welcomed the participants and stressed the commitment of the University of Castilla-La Mancha with the promotion of a culture of peace and tolerance among University professors, researchers and students, and mentioned different initiatives of the University in order to promote high level education in values and cultural diversity. The first session of the meeting focused on the EU strategic and legal approach in order to prevent and combat radicalism within the European Union (internal dimension) and with third States and international organizations (external dimension). Mr Francisco Fonseca-Morillo, Deputy Director General of Justice and Consumers of the EU Commission, stressed the need to combine preventive and combatting measures to fight radicalization and ensure the security of EU citizens in an Area of Freedom, Security and Justice without internal borders. He reminded that security is a matter under the responsibility of the EU Member States, whilst the duty of the EU institutions is to reinforce the actions of the EU Member States and ensure coordination amongst them. With this approach, and in line with the Communication of the Commission supporting the prevention of radicalization leading to violent extremism (COM(2016) 379 final of 14.6.2016), Mr Fonseca-Morillo mentioned that radicalization is an increasingly complex and evolving phenomenon that calls for an in-depth knowledge and a multi-faceted response, including (1) The support of projects and initiatives targeting a better understanding of the drivers underlying radicalisation, (2) Countering terrorist propaganda and hate speech online, (3) Breaking the cycle and addressing radicalisation in prisons, (4) Promoting inclusive education and EU common values, (5) Promoting inclusive, open and resilient societies and reaching out to young people, (6) Reinforcing the security dimension of addressing radicalisation by promoting the exchange of information, police and judicial cooperation, and (7) Addressing violent radicalisation beyond the EU´s borders. Ms Ángeles Gutiérrez Zarza, University Professor of Civil and Criminal Proceedings at UCLM focused her intervention on the strategies and actions developed the EU in order to tackle radicalisation, violent extremism and terrorism in third countries, with special attention to Syria, Iraq and the Mediterranean countries included in the European Neighborhood Policy. In the last part of her intervention, Ms Gutiérrez Zarza wondered where are the missing and non-accompanied children who came to Europe from Syria, Afganistan and other areas of conflict, and stressed the need to address this situation as a matter of urgency. Although the EU institutions have launched some initiatives in order to reinforce the security of minors arriving to the EU borders, a more effective action and further commitment is needed in line with the International Convention of the Rights of the Child and other International and European legal texts. The second session started with an intervention given by Mr Vicente Javier González Mota, Prosecutor at the Audiencia Nacional and Eurojust Correspondent for Terrorism Matters. He shared the difficulties encountered by Spanish judicial authorities when investigating and prosecuting terrorist related criminal offences associated with yihadism, and gave an interesting overview of the reasons leading European women to travel of Syria, Iraq and other areas of conflict to serve Daesh and their fighters. Mr Alfonso Aya Onsalo, Prosecutor at the Spanish Supreme Court Specialised on Hate Speech and Discrimination Criminal Offences, described the long process experienced by the Spanish legislator until the recognition of hate speech criminal offences in the Spanish Criminal Code. He also acknowledged the difficulties face by Prosecutors and other practitioners in order to apply in practice hate speech criminal offences. In the recent past, some religious minorities as the Coptes of Egypt have been specially threatened by radicalisation, violent extremism and terrorism. The culture, religion and art of these minorities must be preserved and promoted, as they are traditionally sources of inspiration and enrichment of many other cultures and civilizations. In the third session, Mr Yehia Yussuf Ramadan illustrated the audience about the most relevant features of the Copte minority. Following his intervention Ms Laura Gutiérrez Martín, a descendant of the ancient Mozarabs community who lived in Toledo jointly with Muslims and Jewish in the Middle Age, underlined the most relevant contributions of the Mozarabes in Art and religious Liturgy. Sessions 4 and 5 of the Expert Meeting were focused on the influence of Muslim and Arab Sciences and Arts in further developments of Botanic, Agriculture, Agronomy, Urban planning, Architecture and Decorative Arts. The speakers were prestigious University professors and experts from the Spanish Ministry of Education of Culture, all of them with a high specialization in the respective topics. Mr Santos Jaime Valor, a prominent researcher at the University of Castilla-La Mancha, guided the participants of the Expert Meeting through the walls of the historic city of Toledo, paying special attention to those architectural elements built under the Andalusian period. The visit finalized at the Mozarab Church of San Lucas, wherein Mr José Antonio Martínez explained the particularities of the Mozarab Liturgy. Session 6 was devoted to the need of promoting inclusive societies and education in values. The session started with a lecture given by Mr Ramón Sánchez González, Professor of Modern History of the Faculty of Education UCLM, focused on the relationship among Moriscos and old-Christians between 1575 and 1610. Then Mr Eduardo F. Rodríguez, Advisor for Education of Adults and Diversity at the Regional Government of Castilla-La Mancha, invited the audience to reflect on the need to promote tolerance in Schools and Institutes. In the past few years, some of the most relevant heritage sites in Middle East have been destroyed or seriously injured by Daesh, Al-Qaida, the Taliban and other terrorist and extremist groups. 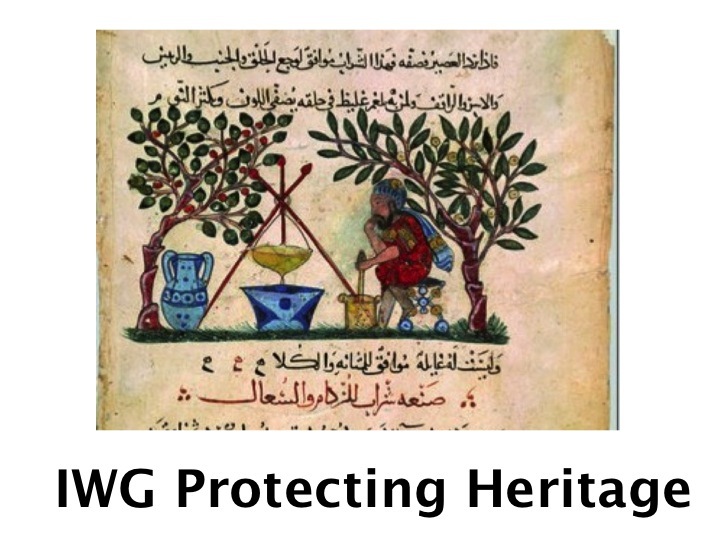 Many of these groups are also involved in illicit trafficking of cultural goods from Middle East countries as a way of financing their terrorist attacks and related activities. The answer given by the International Community of this phenomenon was analyzed by Ms Marina San Román Calvo, Spanish Lawyer and Associate Professor at the University of Burgos, and Ms Elena Piñones, Professor at the University Rey Juan Carlos. The Spanish legal provisions governing the destruction and illicit trafficking of cultural goods were analyzed by Mr Javier Rufino Rus, Spanish Prosecutor of Sevilla for the Protection of Environment, Urban Planning and Protection of Cultural Heritage. He also gave numerous examples of Spanish police operations and judicial investigations undertaken in the past few years in our country against individuals and networks involved in illicit trafficking of cultural goods, and described the difficulties faced by these authorities in order to prosecute and ensure conviction of suspects of such activities. Mr Francisco Jiménez-Villarejo, Prosecutor and Spanish National Member of Eurojust, briefed the audience on the increasing involvement and role of Eurojust in investigations and prosecutions undertaken by EU Member States in close cooperation with third countries against Daesh. He also presented the different strategic reports produced by Eurojust in order to reinforce the judicial dimension in the fight against the Islamic State, Al-Qaida and other related terrorist groups. Mr Santiago J. Fernández Ortiz-Repiso, Teniente Coronel Batallón de Helicópteros de Combate del Acuartelamiento de Almagro, delivered a presentation on the participation of the Spanish Armed Forces in peace keeping missions developed in third States. Mr Javier García-Larrache, Deputy Director General in the fight against Terrorism in the Spanish Ministry of External Relations described in detail United Nations Resolutions adopted by the Security Council in the fight against Daesh. He specially focused on the Resolutions approved in the two-year period 2015-2016 under which Spain was member of the Security Council and took over its Presidency in October 2015 and December 2016. This entry was posted in Relevant projects on 23 July, 2017 by Ángeles Gutiérrez Zarza. This entry was posted in Relevant projects on 9 July, 2017 by Ángeles Gutiérrez Zarza.